Following construction of the dockyard on the shores of Stoke Damerel in the 1690s, this area was often mistakenly, though not officially, called Plymouth-Dock, after her neighbour the nearby town of Plymouth. With growth of the town that subsequently grew around the dockyard, there was never any legal Act, nor official document, specifiying that Stoke Damerel henceforth contain the word Plymouth in its name, yet for over 100 years it was consistently referred to as Plymouth-Dock - even by the Admiralty. Although, sometimes the Admiralty did distinguish the two separate towns on its paperwork, initially referring to 'Dock in Hamoaze', but even that wasn't the correct name for the area that is now known as Devonport. The one legal place where the name Stoke Damerel was documented, thus it should have been used from the start, was The Domesday Book. Again, the Admiralty did sometimes get it right, as some of their paperwork was addressed to 'The Dock at Stoke Damerel' but there was no consistency. Over the years both the Admiralty and others drifted into using the name of nearby Plymouth, and referring to this area as Plymouth-Dock. From the 1690s the parish of Stoke Damerel grew rapidly, and within 100 years became one of England's most important towns. The dockyard, the cause of the growth, was lauded in both naval and parliamentary circles; some naval superiors thought it the best dockyard in Britain. The town eventually became the biggest west of Bristol, outgrowing her two nearest neighbours, Plymouth and Stonehouse. Residents were proud of coming from such an area and by the early 1800s, their resentment of being mistaken for and lumped together with Plymouth - well documented in local history books - came to a head. They petitioned the king for a change of name, that the parish of Stoke Damerel no longer be associated with the name Plymouth. 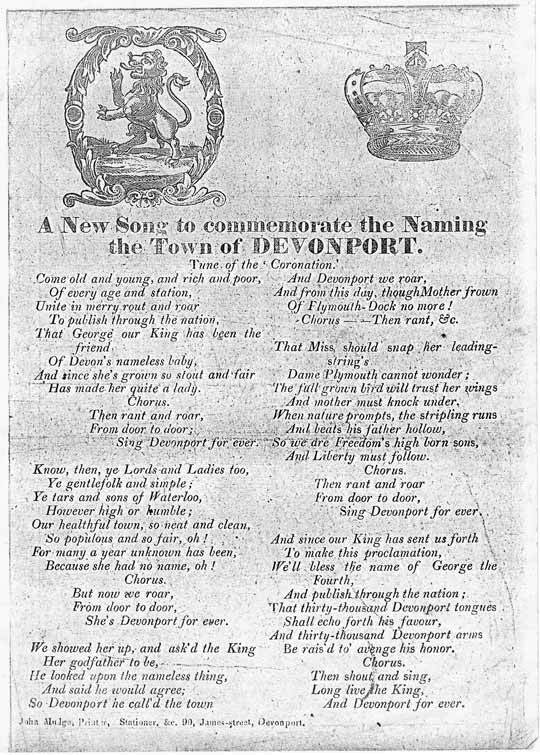 The king accepted the plea and named the town Devonport, being the port of Devon. A proclamation was issued, that the new name was to legally take effect from 1st January 1824. A town plaque was raised to commemorate the event, medals were struck and joyful parties and processions were held in the town. 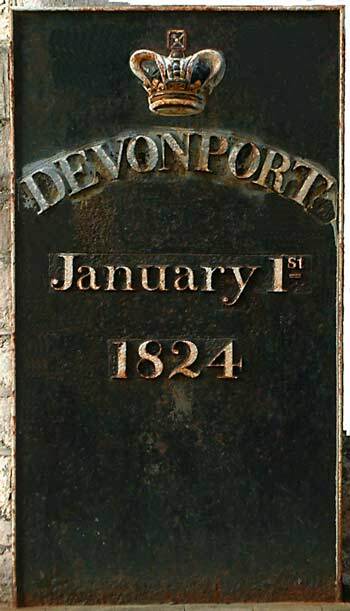 It was and remains an important event in Devonport's history. The town plaque is shown in the image below. Devonport's town plaque has not been looked after; it is rusted, needs paint, and has occasionally suffered from graffiti splashed across it. This plaque is located in the lane between the Guildhall and Devonport Column, at the top of Ker Street. Has made her quite a lady. So populous and so fair, oh! Because she had no name oh! Be rais'd to avenge his honour. The image above shows a leaflet I was lucky enough to purchase from eBay - it contains the words of the song and was published by John Mudge, Printer, Stationer, etc., 90 James Street, Devonport. The original text for Coronation was the hymn All Hail the Power of Jesus' name.